From the budget terms you need to know to how it impacts your state, the best interactives on the looming budget cuts. There's been a lot of talk of the looming budget cuts that, without a last-minute deal, must go into effect by 11:59 p.m. ET on March 1. Obama will meet with congressional leaders on Friday to discuss how to avoid the worst consequences of the sequester. 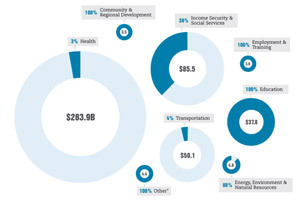 What is the sequester, and how big is it? Here's our quick graphic guide, from the budget terms you need to know, to how it could impact your home state. How would your state be impacted by the sequester? This Washington Post interactive lets you search the state-by-state breakdowns released last weekend by the White House. The Texas Tribune’s interactive makes it easy to see how your state ranks for proposed budget cuts. Use their graphs, or download the data for yourself. 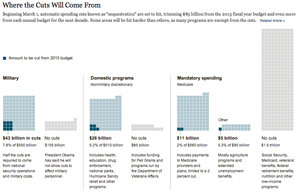 The New York Times graphs where the $85 billion in budget cuts would come from. 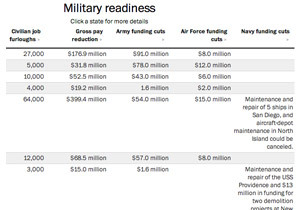 The military budget could lose $43 billion, while health, education and other domestic programs could see $26 billion in cuts. From sequester to “the Gang of Six,” the deficit debate should come with its own dictionary. Frontline's interactive gives a quick recap of the budget jargon you need to know. 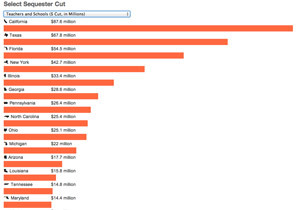 Roughly one-fifth of federal grant funding to states is subject to sequester, Pew reports. Pew charts what’s off-limits and what could come under the knife in cuts to federal grant funding. This graphic from USA Today and the Pew Research Center charts who Americans think is to blame for the budget crisis--and what Congress should do about it now (click to the last infographic). 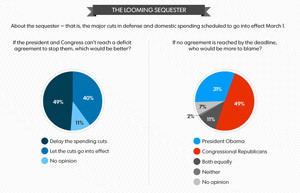 A more recent Gallup poll found similar results, with 45 percent saying the government should avoid the sequester. 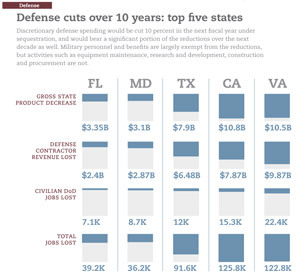 Defense cuts over the next 10 years wouldn’t hurt all states equally. Pew’s Stateline shows how states like Virginia and California would be hardest hit by lost Department of Defense jobs and defense contractor revenue. Did we miss any great graphics? Let us know in the comments or on Twitter.